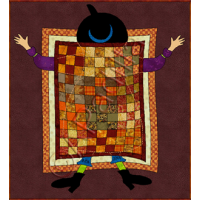 Ever wonder about some of the strange ways of describing some things in quilting? If you ever wondered about how exactly to "sandwich" your quilt, this particular image might have come to mind! Combine appliqué and paper piecing to make this darling little quilt. 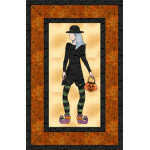 Use your favorite Fall/Halloween fabrics for this one! 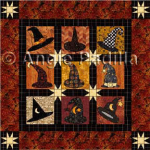 Finished size: 16½ x 18"
A fun applique witch... just in time for Halloween! 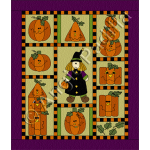 Use as a wallhanging or, even better, as a welco..
Stack all those pumpkins up and surround a cute little witch with them for a fun Halloween wall hang..
A fun nine-patch layout provides the setting for these cute little witch hats. Have some extra fun w.. There is such a thing as a modern witch with a sense of style! We hope you enjoy this one in this li.. 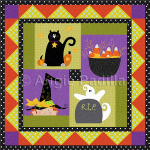 This fun, fun, fun little lap quilt is sure to please any Halloween lover, young and old. 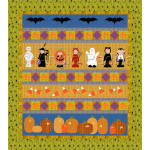 Work it al..
A fun little quilt that portrays the traditional celebration throughout Latin America to honor the d..